Keywords: swan beak injury; wound management plan; wound debridement; hydrocolloid dressings; moisture vapour permeable dressings. In waterfowl, the bill (rhamphotheca) is soft and vulnerable to trauma. Swans may therefore present with bill injuries following collisions or other accidents. The treatment of any casualty wild bird should have, as its objective, the speedy return of a fit, healthy bird, back to the wild. The wound management plan should therefore seek to promote healing in the shortest possible time. 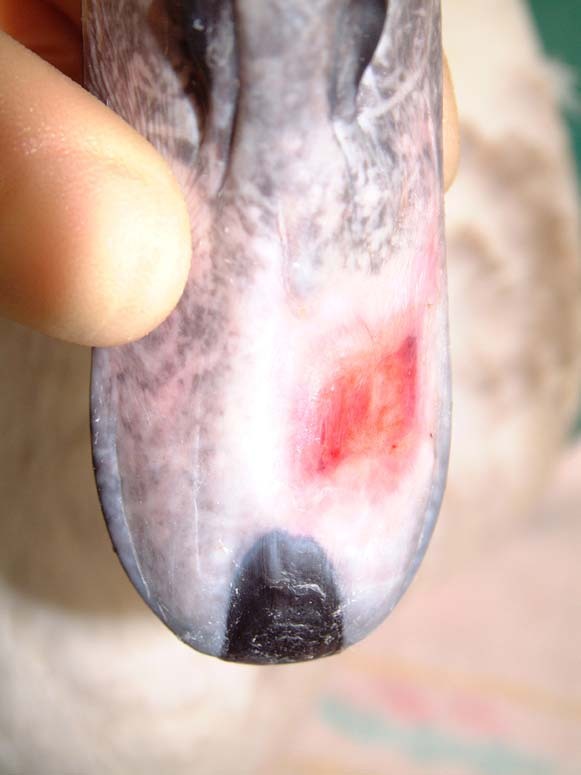 The swan's beak will be regularly immersed in water and the choice of wound dressing should be influenced by whether it can provide protection of the wound in a wet environment. Thin hydrocolloid dressings are pliable, adhere well to the surface of the beak and provide an ideal environment for wound healing. Such dressings can withstand submersion in water. The mute swan (Cygnus olor) is a common bird on British waterways with a breeding population, in 1988-1991, of some 25,800 to 27,000 birds . 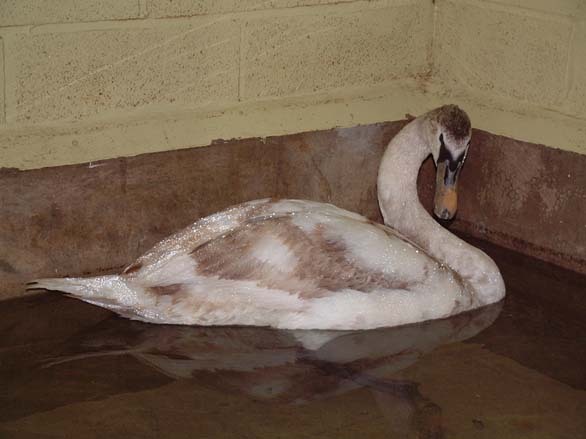 The mute swan frequently presents to wildlife hospitals and rehabilitation centres . Many of these swans have traumatic injuries following collisions and other accidents. Injuries involving the bird's beak (or bill, as it is also known) are not uncommon. 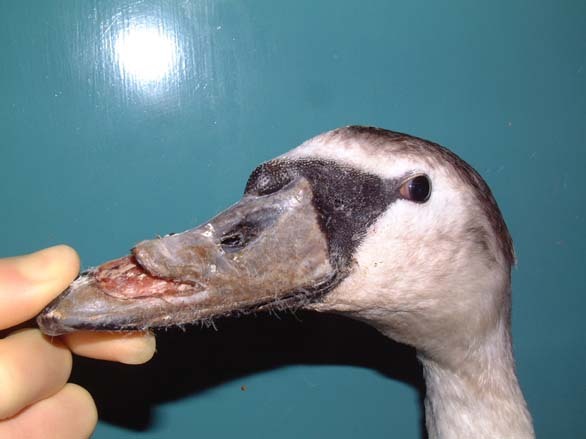 This case report describes the presentation and management of a large flap wound to the beak of a young mute swan. 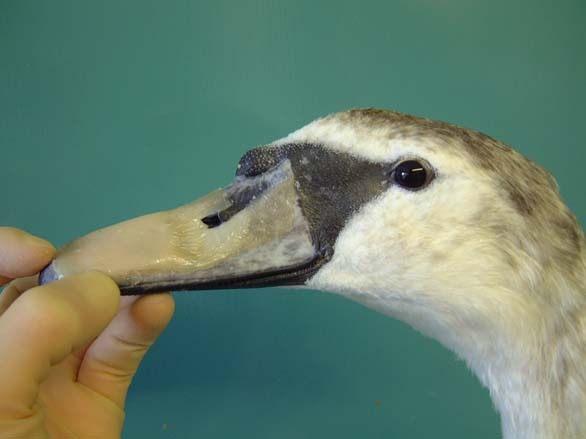 A juvenile mute swan (Cygnus olor)presented to the hospital with a large flap wound to its beak. On initial examination, the bird weighed 9.15kg. It was able to stand and there were no other obvious injuries. The wound was flushed with dilute povidone iodine and packed with a hydrocolloid gel (Nugel). The wound was then covered with a moisture vapour permeable dressing (Opsite). Clavulanate amoxycillin (Synulox) was administered orally (500mg, equivalent to 55mg/kg) together with carprofen (Rimadyl), a non-steroidal anti-inflammatory agent (50mg, equivalent to 5.5mg/kg). On the following day, the swan underwent a full veterinary examination. A large flap wound had been created over the left side of the bird's beak. The wound extended caudally for some distance and was quite old and dry ( Figure 1). The bird's packed cell volume (PCV) was unremarkable: PCV = 36% (range: 31-48%); whilst its total protein (TP) was slightly elevated at 61 g/l (range: 35-55g/l). Clavulanate amoxycillin (Augmentin) was administered intravenously (600mg, equivalent to 65mg/kg) together with carprofen 5mg/kg to provide preoperative antibiotic cover and analgesia. Figure 1 - Lateral view of head showing the extent of the flap wound (day 2). The swan was then anaesthetised with an intravenous injection of 2mg xylazine and 90mg ketamine (as per ). The bird was intubated with a cuffed size 6 endotracheal tube ( Figure 2). Intravenous fluid therapy (0.9% saline) was provided into the medial tarsometatarsal vein at a rate of 40ml/kg/h. 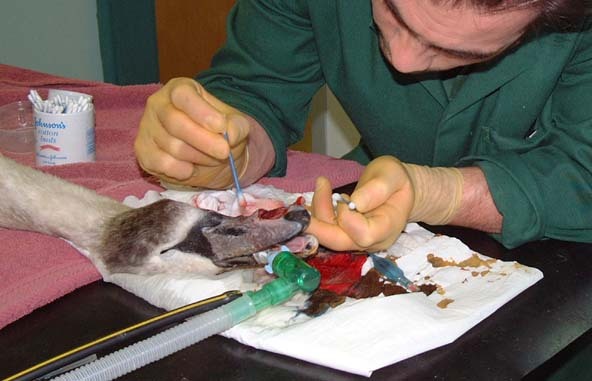 The beak was cleaned with a solution of 0.75% povidone iodine. The flap was then resected to eliminate the majority of the cavity that existed between the flap and the underlying bone. All the remaining debris and dead tissue was removed by chemical debridement using organic acids (Dermisol) ( Figure 3). The clean wound ( Figure 4) was packed with a hydrocolloid gel (Nugel) and covered with a strip of thin hydrocolloid dressing (Duoderm Extra Thin). A moisture vapour permeable dressing (Opsite) was applied as a secondary dressing to provide added security ( Figure 5). 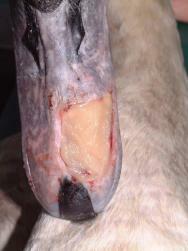 Figure 2 - Anaesthetised swan prior to wound debridement (day 2). The wound is dried out and heavily contaminated. Figure 3 - Cleaning and debriding the wound (day 2). Figure 4 - Close up of the wound following flap resection and wound debridement (day 2). Exposed bone is clearly visible. Swelling is also evident at the base of the flap, which is slightly under run. 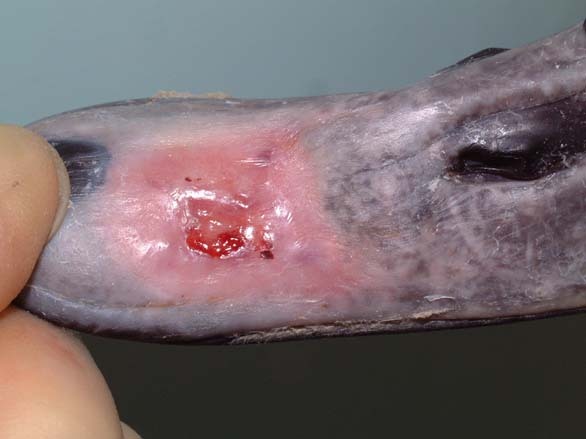 Figure 5 - Wound packed with hydrocolloid gel (Nugel) and then covered with a strip of thin hydrocolloid dressing (Duoderm Extra Thin) and a moisture vapour permeable dressing (Opsite). The latter can be seen to cover the nostrils; holes were made through the dressing to allow air to flow. Antibiotic cover was continued with clavulanate amoxycillin (500mg/swan orally twice daily) for the following 14 days. On day 3 the swan was re-examined. An anthelmintic (wormer) was administered (fenbendazole at 25mg/kg orally) together with 5ml of a multivitamin and iron supplement. A further dose of carprofen was also administered. 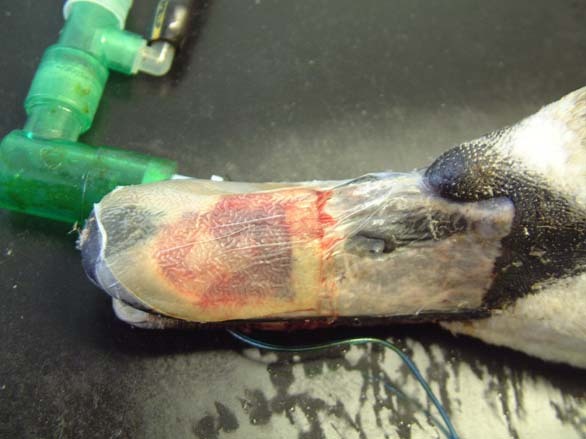 On day 4, the swan was re-examined and the wound flushed with organic acids (Dermisol). The wound was then packed with a hydrocolloid paste (Orabase) ( Figure 6) and a strip of thin hydrocolloid dressing (Duoderm Extra Thin) applied over the wound. The dressing was cut with wings, to maximise the contact area with the beak ( Figure 7). 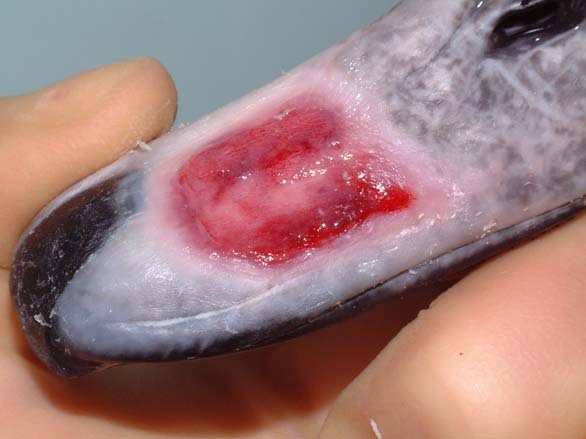 Figure 6 - Wound packed with a hydrocolloid paste (Orabase) (day 4). The black, finger-nail shaped unguis maxillaries is clearly visible below the wound. Figure 7 - A thin hydrocolloid dressing (Duoderm Extra Thin) is applied over the hydrocolloid paste dressing (Orabase) (day 4). Note the wings either side of the bird's nostrils, used to maximise the contact area of the dressing with the beak. The wound was cleaned and dressed at three day intervals: on day 7 and again on day 10. By this stage granulation tissue was evident within the wound and there was good epithelialisation around the wound edges. The next wound dressing change took place on day 15, after 5 days ( Figure 8), at which point antibiotic treatment was discontinued. The wound was healing well ( Figure 9); however, the swan had lost over a kilo in weight since its arrival and now weighed 7.9kg. In view of this weight loss and the fact that the dressings were providing the wound with good protection it was decided to move the swan outside onto a waterfowl paddock. The swan was assessed on water the following day ( Figure 10 and Figure 11) and, after ascertaining that the dressings were secure, it was moved outside. Figure 8 - Five-day old dressing (day 15). Figure 9 - Epithelialising wound (day 15). Figure 10 - Swan on water with one-day old dressing securely in place (day 15). 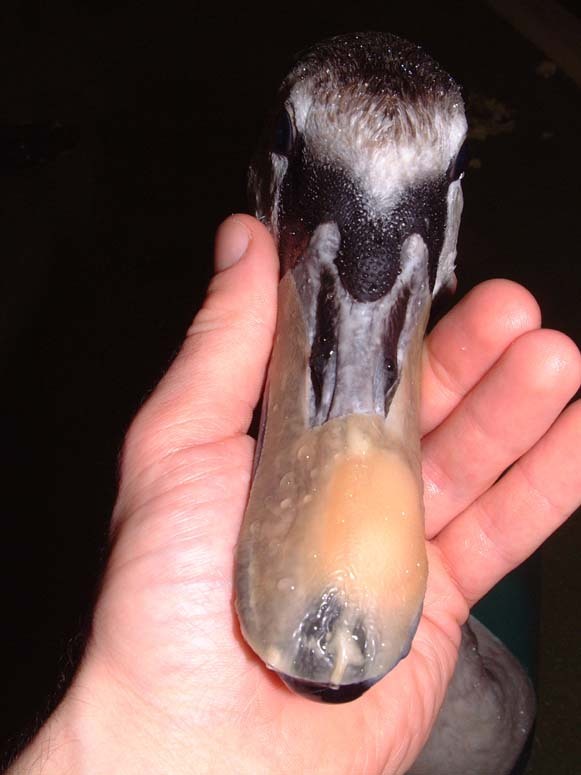 Figure 11 - Close up of one-day old dressing securely in place over beak after 24 hours on water (day 15). Unfortunately the swan became very distressed in the waterfowl paddock and, on day 19, succeeded in removing the dressing and damaging its beak. It was brought in for reassessment. Its body weight had fallen to 7.25kg. The swan was re-anaesthetised on day 20 and the beak examined. The wound was inflamed; the thin layer of new epithelial cells had been scraped away and the underlying granulation tissue traumatised. The wound was debrided to expose healthy tissue and redressed. Antibiotics were again provided, consisting of a further nine-day course of clavulanate amoxycillin (500mg/swan orally twice daily). In order to minimise stress, wound debridement was performed on days 24 and 29 under general anaesthesia. By day 29, a complete bed of granulation tissue was established ( Figure 12). To reduce handling, a switch was made from clavulanate amoxycillin to marbofloxacin; this meant that medication could be given once daily (10mg/kg orally daily) instead of twice daily. 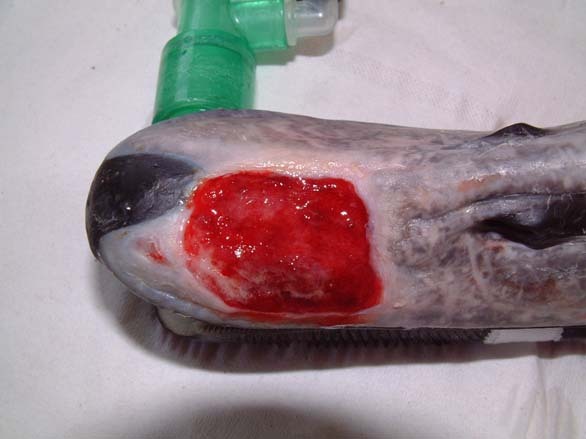 Figure 12 - Complete bed of granulation tissue covering wound (day 29). On day 33, when the dressing was next changed, there was evidence of renewed epithelialisation. Further dressing changes took place on days 36 and 40 ( Figure 13). Thereafter dressing changes took place approximately every five days: on days 45, 46, 52, 57, 61 and 66. The dressing change on day 46 was necessary because the edge of the dressing had lifted. The whole dressing was therefore replaced in two layers: a small dressing over the wound and a second, larger dressing, over the top. By day 57 there was good epithelialisation on all four corners ( Figure 14). By day 66 the wound had almost epithelialised over ( Figure 15). Figure 13 - Epithelialising wound (day 40). Figure 14 - Epithelialising wound (day 57). All signs of inflammation have gone. Figure 15 - Wound epithelialising well (day 66). On day 71 the dressing was removed for the last time. The wound had almost completely healed over. A shark oil cream containing beer yeast extract (Preparation H) was applied to the beak to promote further epithelialisation and help toughen up the thin epithelial layer. The wound was re-examined on day 72 ( Figure 16) and again on day 74 and Preparation H applied on both occasions. The wound was healing well and the swan was moved outside on day 74. A final examination was performed on day 80. The epithelium had toughened up and had not suffered any damage during the nine days the swan had spent in the waterfowl paddock. Treatment was therefore discontinued. The swan was BTO (British Trust for Ornithology) ringed and eventually released on day 85. Figure 16 - The wound, healing well (day 72). The horny beak or bill (rhamphotheca) is a hard, tough keratinised epidermal structure in birds of prey, as well as in seed and grass eaters. The hard horny tissue enables the beak to be used as a tool or weapon. In waterfowl, such as ducks, geese and swans, the sheath of keratin overlying the skeleton of the bill is much thinner and softer,, except at the very tip. The rhamphotheca is a modified horny layer consisting of layers of flattened keratin-filled cells, separated from the bones of the upper and lower jaws by a thin, fibrous dermis. Hardness depends on the content of orientated hydroxyapatite crystals . In swans and other waterfowl only the tip is hard and this hard tip contains a tactile sensory structure: the bill tip organ,. The hard tip of the upper bill is shaped like a finger nail and forms a horny plate. A similar horny plate is present on the inner and outer surfaces of the lower bill tip and these are respectively called the unguis maxillaries and unguis mandibularis. In waterfowl, and swans in particular, the soft rhamphotheca is vulnerable to trauma and easily injured. Swans fly at speeds of 30-50mph and have difficulty making sudden changes in direction. This is probably due to a number of factors including their size and weight, as well as their relatively poor forward vision. Collisions occur regularly and can result in beak injuries . 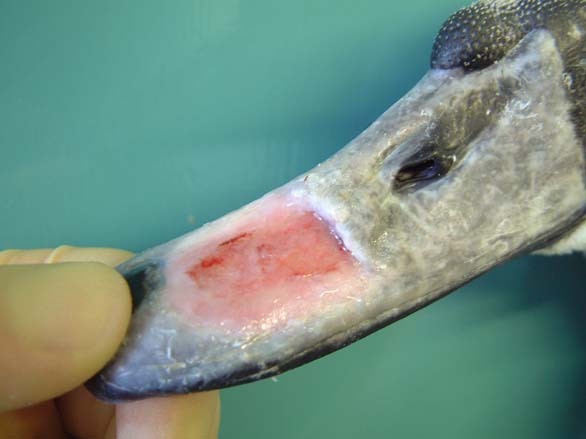 Beak injuries will heal by a process of granulation and epithelialisation, much as with any other epidermal tissue. The rhamphotheca has a good blood supply and usually heals well. Its ability to heal well following trauma has been used both by owners marking their birds and by surgeons operating on the bill (see Wound management in the avian wildlife casualty). The nature of the patient means that the beak will be regularly immersed under water and in food bowls. This can pose a number of practical problems when dressing the wound to protect it from contamination and damage. A large wound, such as the one described in this case report, cannot be repaired surgically and must be left to heal by secondary intention. The objective of any wound management plan should be to keep the wound clean and moist to facilitate the spread of granulation tissue over the exposed bone and protect the bone and underlying tissues from dessication. This process will take a considerable period of time and is likely to require many dressing changes. Whilst this may be onerous it is also very necessary as it is important that a wound management plan be used that will allow the wound to heal in the shortest possible space of time. This is particularly important in wild birds where rapid rehabilitation and early release back to the wild is desirable. Before the wound could be dressed it had to be assessed and debrided. 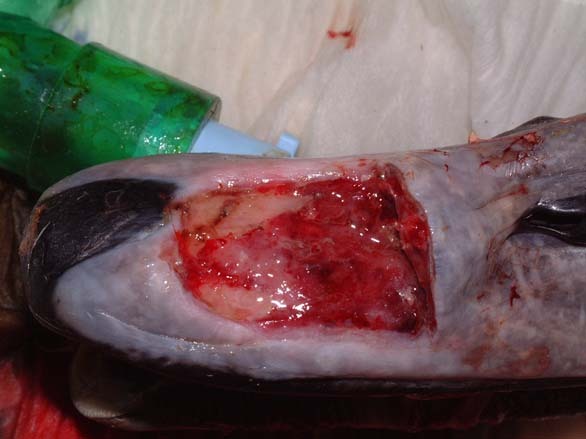 The wound ( Figure 1) was heavily contaminated and there was considerable soft tissue trauma. The flap of beak was, in the author's opinion, not viable and had to be resected. Efforts were made to preserve the base of the flap but this left a significant cavity ( Figure 2). Aggressive debridement involved removing any dried or necrotic tissue as well as a number of bony splinters from the upper mandible. Chemical debridement with organic acids (Dermisol), was used to promote breakdown of any devitalised tissue. The low pH of this preparation inhibits bacterial multiplication and promotes collagen chain breakdown; it also helps oxygenate tissues and thus promotes granulation. Wound dressings were selected that would ensure protection of the wound in a wet environment. The use of moisture vapour permeable and hydrocolloid dressings has been described in birds, but not in a wet environment. In the case described, a hydrocolloid gel was used initially and covered with a moisture vapour permeable dressing (Opsite). This did not provide adequate wound protection and failed to keep the wound moist. A hydrocolloid paste designed for use in mouth ulcers (Orabase) was used to pack the wound. This formed a resilient protective film over the wound and was further protected by a single layer (and sometimes a double layer) of a thin and pliable hydrocolloid dressing (Duoderm Extra Thin). The dressings were not damaged or otherwise adversely affected by being submerged in water, either in a pool ( Figure 10 and Figure 11) or in a feed bowl. This is particularly important, as patients need to be allowed to exhibit as much natural behaviour as possible in order to minimise stress. The hydrocolloid dressing used was much tougher and more durable than the moisture vapour permeable dressing. It was also sufficiently flexible and compliant to be able to be applied to the surface of the beak. The dressings adhered well to the cuticle of the beak but did not adhere to, or cause any damage to, the granulation tissue or new epithelium. These characteristics made it a suitable wound dressing for this type of wound and provided an ideal environment for wound healing. Granulation tissue was evident by day 7 and rapidly covered the wound. Good epithelialisation was evident by day 15 ( Figure 9) though there was still a ridge at the proximal edge (base of the wound). Once a healthy bed of granulation tissue has been established, dressings can be changed weekly  and antibiotic cover can be discontinued. With the bird off daily treatment, it was felt that the swan could be moved outside as this would help to minimise stress. This was, however, a little premature, as the wound was still vulnerable to trauma and became traumatised. This set the wound back two weeks. 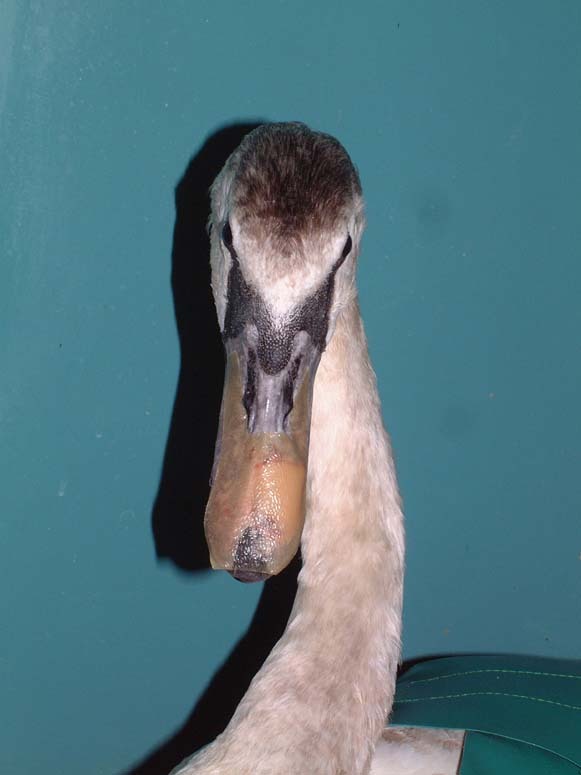 With the swan re-hospitalised, the wound was redressed after first resecting the damaged granulation tissue; a broad-spectrum antibiotic was given until a healthy bed of granulation tissue had been re-established. During this time attempts were made to minimise stress by providing the swan with a companion and giving the birds access to a sunny outside run. The wound had epithelialised over almost completely by the time the last dressing was removed on day 71. As the epithelium was still a little pink and fragile a cream (Preparation H) was applied to protect the epithelium and promote epithelial spread over the remainder of the wound. Beer yeast extracts in the cream increase cell oxygen consumption and stimulate epithelialisation and collagen synthesis . Preparation H has been widely used in birds of prey with wing tip oedema where it is claimed to promote blood supply to, and venous drainage from, the affected wing. According to the data sheet, it acts by relieving pain and irritation and by helping to shrink tissues swollen by inflammation. All of these actions are likely to benefit a healing beak wound: any reduction in pain and irritation will help to reduce the likelihood of self trauma whilst any shrinkage of the tissues will help contract down and toughen the healing wound. It is particularly important to use a wound management plan for wild birds that will allow the wound to heal as quickly as possible. Extensive flap wounds on swan's bills can be successfully repaired using a wound management programme involving wound debridement and the repeated application of thin hydrocolloid dressings to the bill. These dressings are pliable and can be applied to the surface of the beak without causing trauma to the granulation tissue or new epithelium. In addition, they are more durable than moisture vapour permeable dressings and can be used in wet environments. 1. Snow DW, Perrins CM. Birds of the Western Palaearctic. Oxford: Oxford University Press, 1998; 162-65. 2. Cooke SW. Waterfowl: swans, geese, ducks, grebes and divers. In: BSAVA Manual of Wildlife Casualties. Cheltenham: BSAVA, 2003; 219-31. 3. Routh A, Painter KS. 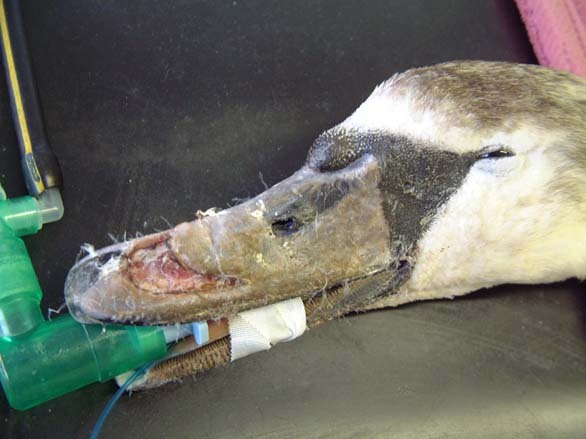 The use of intravenous ketamine and xylazine for induction of general anaesthesia in the mute swan (Cygnus olor): A review of 130 cases. In: Proceedings of the Autumn meeting of the British Zoological Society; November 20-21; London: BVZS, 1999. 17-20. 4. Coles BH. Avian Medicine and Surgery. Oxford: Blackwell Science Ltd, 1997. 5. Mayaud N. T�guments et phan�res. In: Grass� PP, editor. Trait� de Zoologie. Paris: Masson, 1950; 15. 6. Spearman RIC, Hardy JA. Integument. In: King AS, McLelland J, editors. Form and Function in Birds. London: Academic Press, 1985; 1-52. 7. Gottschaldt KM. Structure and function of avian somatosensory receptors. In: King AS, McLelland J, editors. Form and Function in Birds. London: Academic Press, 1985; 375-461. 8. Beer JV, Ogilvie MA. Mortality. In: Scott P, The Wildfowl Trust, editors. The Swans. London: Michael Joseph Ltd, 1972; 125-42. 9. Routh A. Veterinary care of the mute swan. In Practice 2000; 22: 426-43. 10. Remy D, Witz M. Conduite � tenir devant une plaie. Point V�t�rinaire 1998; 29(num�ro sp�cial): 573-81. 11. Degernes LA. Trauma medicine. In: Ritchie BW, Harrison GJ, Harrison LR, editors. Avian Medicine: Principles and application. Lake Worth, FL: Wingers Publishing, 1994; 417-33. 12. Simpson GN. Wing problems. In: Beynon PH, Forbes NA, Harcourt-Brown NH, editors. BSAVA Manual of Raptors, Pigeons and Waterfowl. Cheltenham: BSAVA, 1996; 169-79.